In downtown Toronto at CHAZ.Yorkville, Developer 45 Charles Ltd. and Project Manager Edenshaw Homes are changing the way condo shoppers think about luxury! The 703 square-foot Fringe suite is a perfect example of how life at this successful condominium marries outdoor and indoor living. Designed by Cecconi Simone, the Fringe square footage includes a 123 square-foot recessed balcony that runs the length of the suite. This is the ideal spot to have your morning coffee and exercise your green thumb with a container garden. In fact, this outdoor feature is so spacious that during warm weather, you could entertain guests with an al fresco meal. 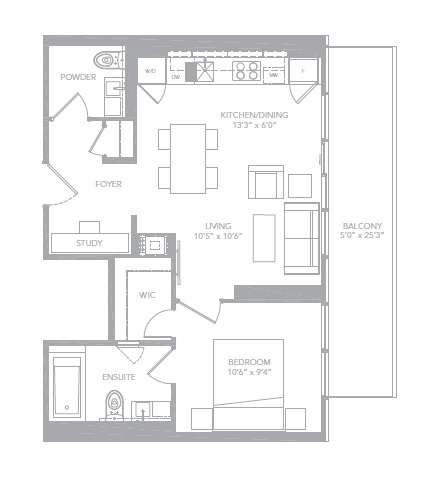 This one-bedroom + study Fringe suite also includes a handy powder room and ample coat closet just off the foyer. Clean Euro-inspired design creates an open-concept kitchen/dining/living space enhanced with wide-plank laminate floors underfoot and smooth ceilings above. Owners will absolutely love the innovative glass-shelf backsplash storage space courtesy of Cecconi Simone’s imagination. What a brilliant idea! And of course, along with the balcony, floor-to-ceiling windows infuse the entire area with natural light. The study in this suite makes an ideal home office, especially with CHAZ.Yorkville offering the fastest Internet speeds in Toronto. Also overlooking the balcony, the master bedroom is a lovely haven with a walk-in closet and a contemporary ensuite with a custom six-foot recessed medicine cabinet – another Cecconi Simone stroke of genius. All of the designs at CHAZ.Yorkville epitomize this fresh new condominium, where prices begin from just the low-$300,000s. Check out all the wonderful floorplans at ChazYorkville.com.